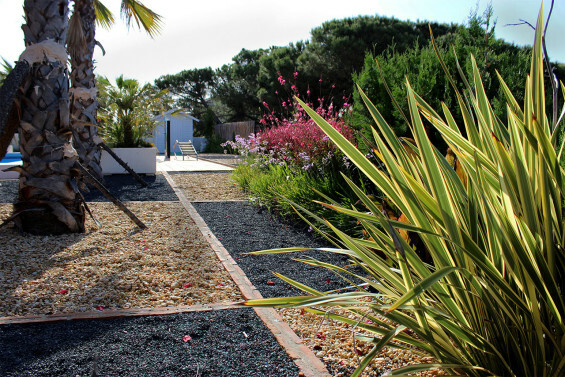 “Las Violetas” Garden was designed in 2013 in the Costa de la Luz region of Huelva, Spain. 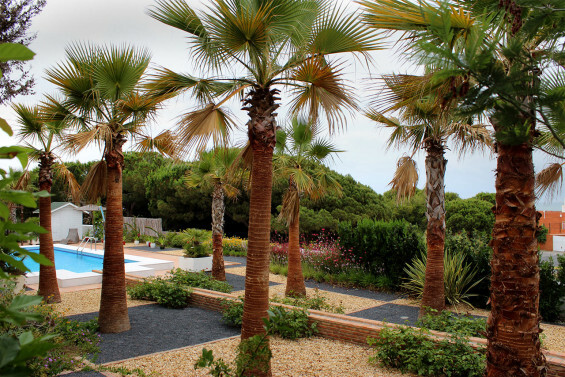 The garden is 1100 m2 and originally was mainly lawn and trees in poor condition. 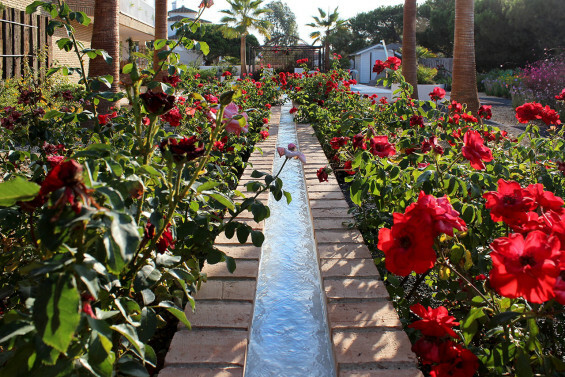 The concept for the gardens was to create “Las Violetas” garden is a more sustainable garden, saving up to 60% of water consumption, and reducing both inorganic fertilizers and pesticides contents in to respect the environment. 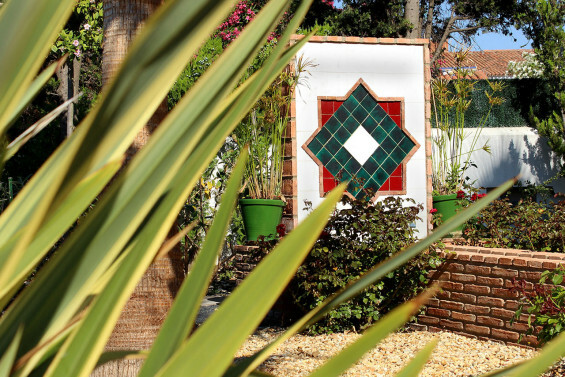 No less important is the aesthetical value of the Garden; At this stage I decided to highlight a deeply arabesque character of Las Violetas Garden, where the enclosure dominates the garden with decorative detailed walls; and once inside, the geometrical design creates a peaceful and garden for quiet relaxation. Water defines the most decorative element inside “Las Violetas”; whether moving through a canal or calm as in a pond. 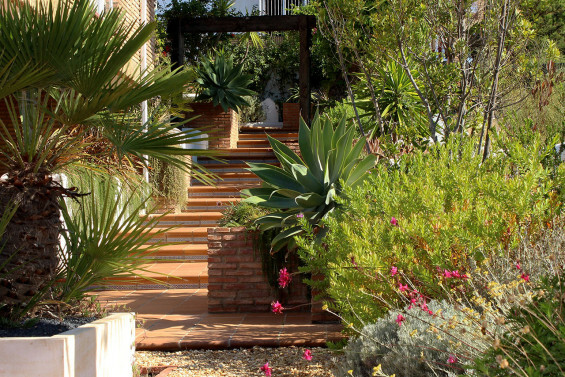 Lushness and Exuberance set the harmony of the vegetation. 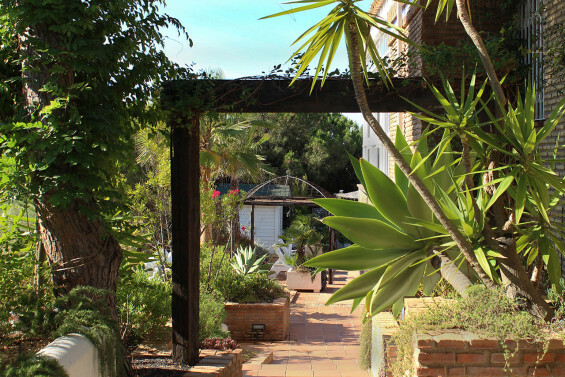 “Las Violetas” Garden, is features by four main areas with the house as the central focus of the property, which is a sloped area looking out over the Atlantic Ocean. The first area accessing to the house, is oriented to the North face where the vegetation is more austere, it looks like a passageway area to which no more relevance is expected. A second area is “The Grand staircase”, which is exposed to the Eastern side, has been entirely redesigned to build flowerbeds of different volumes and textures that visually turns the original route into a more sensory and intuitive pathway. 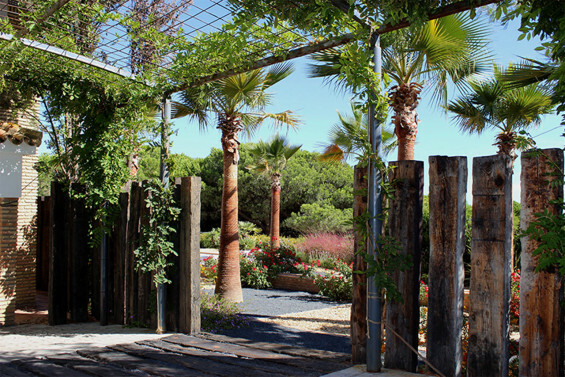 A Wooden Gateway is built framing a large specimen of Agave attenuata. Ficus benjamina and Ligustrum lucidum old plantations are used for fencing, aromatic species as Rosmarinus officinalis, Lavandula dentata, Santolina chamaecyparissus and also climber species as Jasminum polyanthum, Rosa banksia lutea and Passiflora quadrangularis, including other species distinguished by their colour as Phormium tenax ‘atropurpurea’ and Berberis thunbergii, are grown for landscaping purposes. To the western side of the property, lying over a stepped slope too, a pruned Thuja occidentalis created perimeter hedges replacing entire lawn area, a new larger parking area was redesigned to combine concrete cobbles with old wooden railway sleepers, creating a transition between the top and the bottom areas of the house. Raised beds border the gravel limestone pathway. 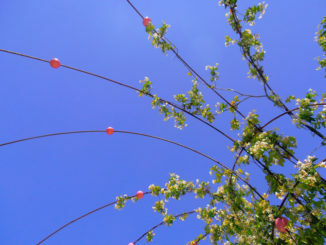 Ailanthus altissima was planted to soften and to hide the real height of the house, as well as Phyllostachys nigra was planted to create intimacy. Using old wooden railway sleepers arranged vertically serves two different functions; to delineate the parking are, and also, as a boundary fence to create privacy for the owners. For the Ancient Arabian culture, The Paradise, meant that place jealously guarded to the foreign cultures, that place where water emanation always flowed through drainage channels to irrigate alignments of fruit trees, which not only provide fruit, but also shade and a place where to plant some other plants for color, aroma and to be used a spices in cooking. 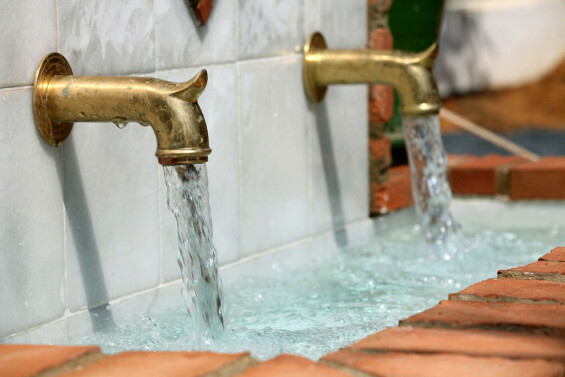 A fountain and long water channel were built using the same type of marble and precast bricks of natural stone. This channel displays the link between a new resource of water and the existing swimming pool, creating a design unifying the two elements. At the opposite side of the swimming pool, it is built an iron pergola using the same arabesque style, creating so, a new axis of design: pergola – pool- channel – fountain , which add character and own meaning to the Garden. 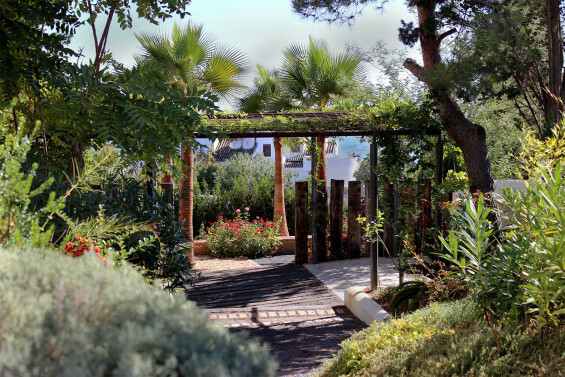 In conclusion, “Las Violetas” Garden has been designed to take time to fully enjoy the landscape with the five senses. Engineer & designer | Juan José Fernández Acosta. Ingeniero Técnico Agrícola. Landscaper. Contractors | Construcciones Francisco Romero. CFR. Trigueros, Huelva (Spain).